After a nearly 12-year absence, Sony announced the return of the aibo robot pet. The new model of aibo, ERS-1000, uses an unspecified 64-bit quad core CPU, in addition to a variety of custom-developed actuators and sensors allowing aibo to move freely and interact with humans and the environment. The aibo can move its body along 22 axes, and can provide visual cues with OLED-display eyes. Four microphones and a speaker facilitate audio input and output, and two fisheye cameras with simultaneous location and mapping (SLAM) capabilities allow it to detect objects, in much the same way self-driving car technology works. The aibo, or "Artificial Intelligence Robot," was first released in 1999 as a project from Sony's Computer Science Laboratory, a research division started in the early 1990s. In 2006, then-CEO Howard Stringer discontinued the product line as part of a larger restructuring effort. For now, the ERS-1000 is limited to a Japanese release, exclusively through the Sony Store. Given the existence of an English-language website, an international release seems likely in the future. The ERS-1000 costs 198,000 JPY ($1733 USD), with a required cloud software subscription, allowing for interaction through an app (available for Android and iOS). The subscription also enables backups of your aibo, which can be transferred to a new unit in the event your aibo is damaged beyond repair. The cloud subscription service is 90,000 JPY ($788) upfront for three years, or payable in monthly installments as part of a three-year contract for 2980 JPY ($26.09). Additionally, an aibo Support Care plan is available, granting 50% off of "checkups" and repair costs for an additional fee. One accessory—the aibone—was launched simultaneously for 2980 JPY ($26.09). 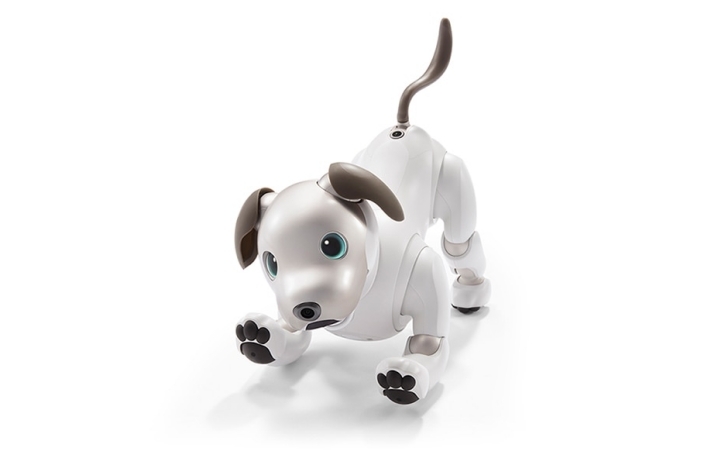 As the name implies, the aibone is a vaguely bone-like accessory which purports to "[spice] up your life with aibo." It will be possible to teach aibo additional "tricks" as DLC through the app. Preorders for the ERS-1000 opened at 11:01 PM on November 1st, in Japan, with general availability starting on January 11, 2018. The repetition of 1—that is, preorders on 11/1 and general availability on 1/11—is a pun. Reading the English word "one" phonetically in Japanese produces "wan," the sound of a dog's bark. This same pun is used by SoftBank as part of their ad campaigns since 2007, which feature a white Shiba Inu.